Saturday was the official kickoff of the SpriteStitch.com Stitch/Quilt-along. Officially it’s a Stitch-along, but since I’m doing it as a quilt, it’s a Quilt-along (QAL) for me. After we submitted designs (52 in total), everyone got a week to vote on their favorites. From our favorites, the moderator randomly selected our first pattern on Saturday. We have a week to work on it and then next Saturday, the second pattern is chosen at random. Repeat for 4 weeks. I’m using the Pellon 906F which is a featherweight fusible. In the picture, you can see how it’s very thin and translucent so it shouldn’t add too much weight to the finished product. This project will use about 17 yards of it (it’s only 20″ wide) so I ended up buying a bolt at JoAnns of 20 yards. 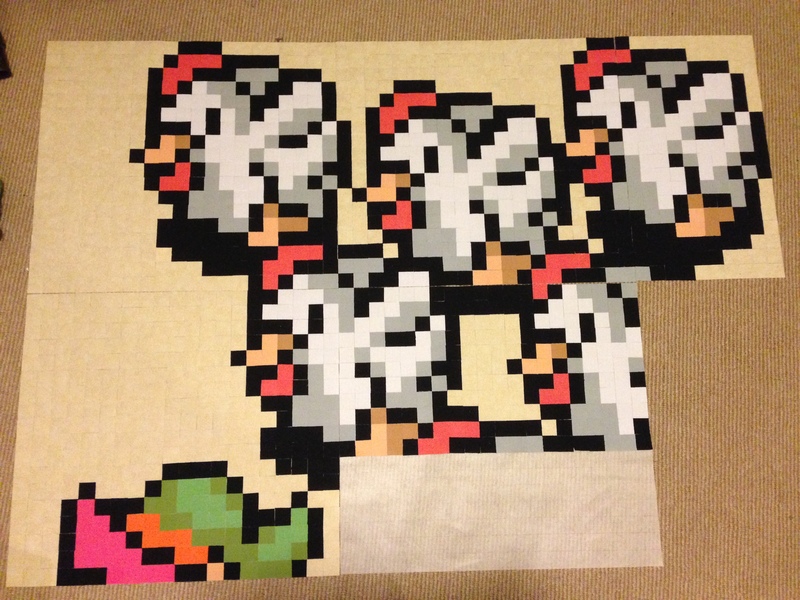 I cut out the different size pieces that I’ll need for my first block (what’s in the picture is just for one block). I turned on Netflix in the background and drew out my grid. 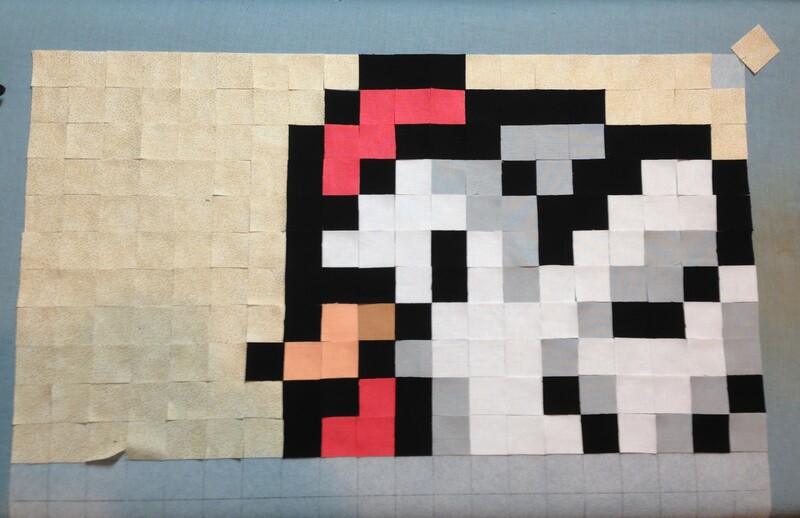 The finished squares will be 1/2″ so the unfinished squares are 1″, as well as the grid. 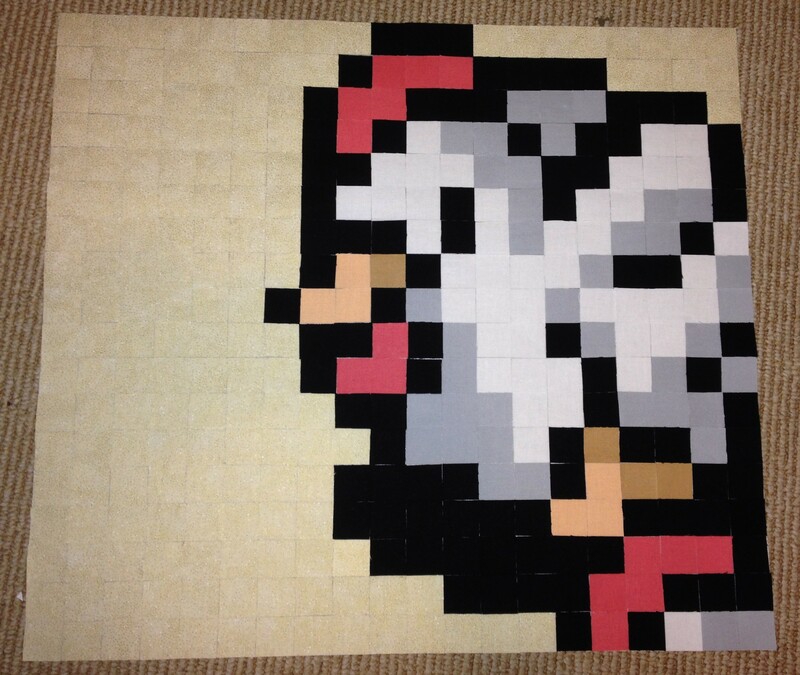 The pieces of Pellon add up to be 50″ x 50″. I just used a regular mechanical pencil to draw the grid lines on. Next up was cutting the zillion squares. For this, I (finally) broke down and bought the Shape Cut ruler by June Tailor. It has slots in the ruler every 1/2″ (the slots are easier to see at the bottom) so you lay out your fabric and then cut at the increment that you need. 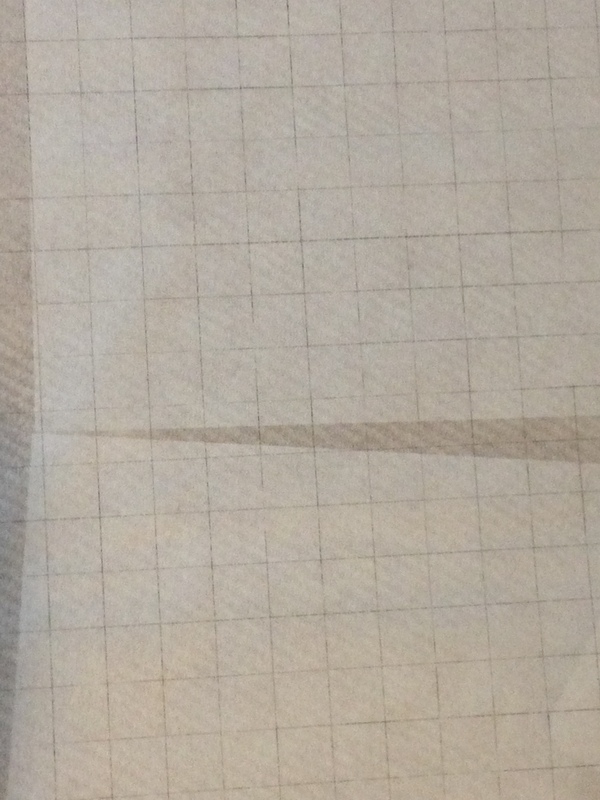 You can cut strips, and then if you want squares, you turn the ruler 90 degrees and subcut into squares. 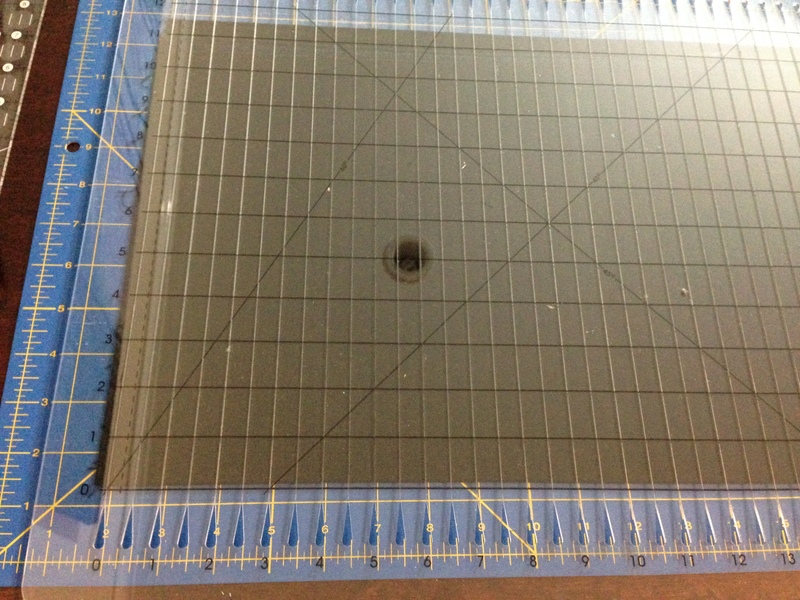 Also, the circle in the center of the ruler is my light fixture… the rulers are very reflective. Since I’m cutting 10,000 squares this month, the ruler seemed like an appropriate investment. This is the first time that I used it and it was amazing. I cut about 3,000 squares in an hour and a half. To hold the fabric and ruler, I did need to get my fingers really close to the rotary blade, so I just ordered the Klutz Glove to protect my hand. The subtitle of this project is “how I finally used every tool and gadget I’ve ever purchased”. 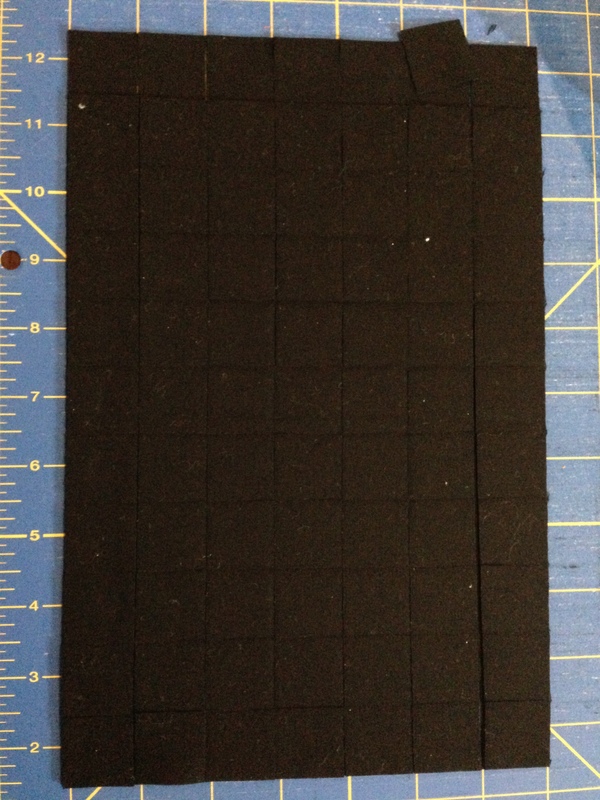 This picture is the black fabric after it had been turned into squares. 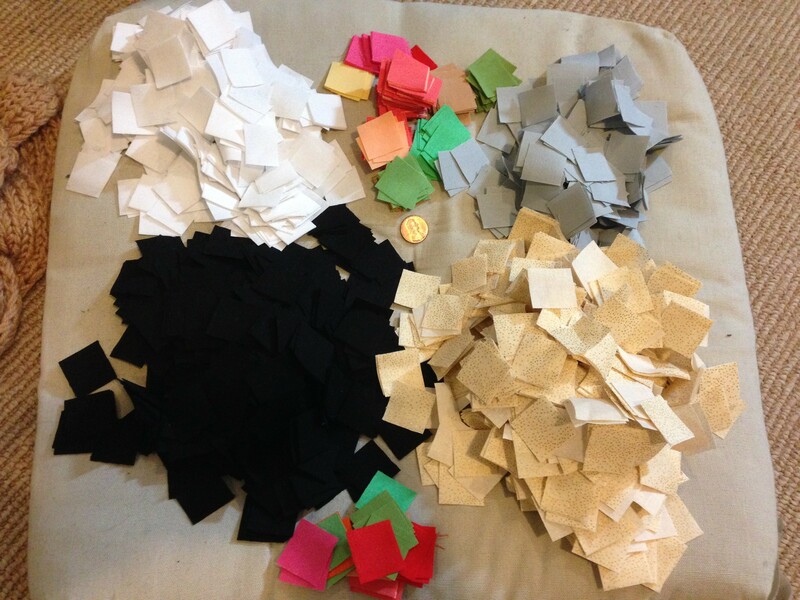 And here are all ~3,000 squares (I only need 2,500 but I cut extras of the blacks, whites, and background). 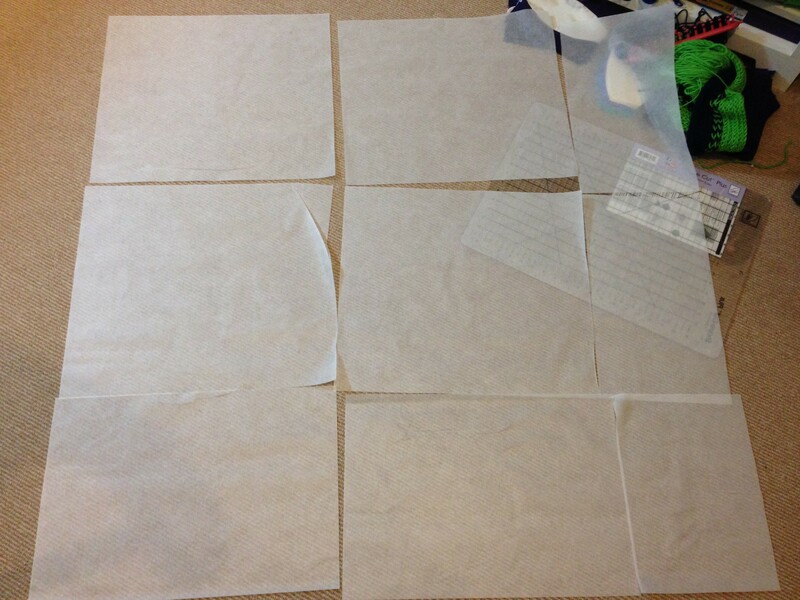 The next day, I went over to my ironing board, laid out the first piece of the fusible interfacing grid, and started placing my squares. These have not been ironed yet, just laid out. My ironing board can only comfortably hold about 11″ worth of squares, so I’d lay 11 rows and then iron. I fused panels 1-4 and part of panel 5. The panels are not connected to each other; that will be the very last step in assembling the block. Tonight, I plan to finish fusing panels 5-9. Then Tuesday – Friday all involve sewing and pressing seams. 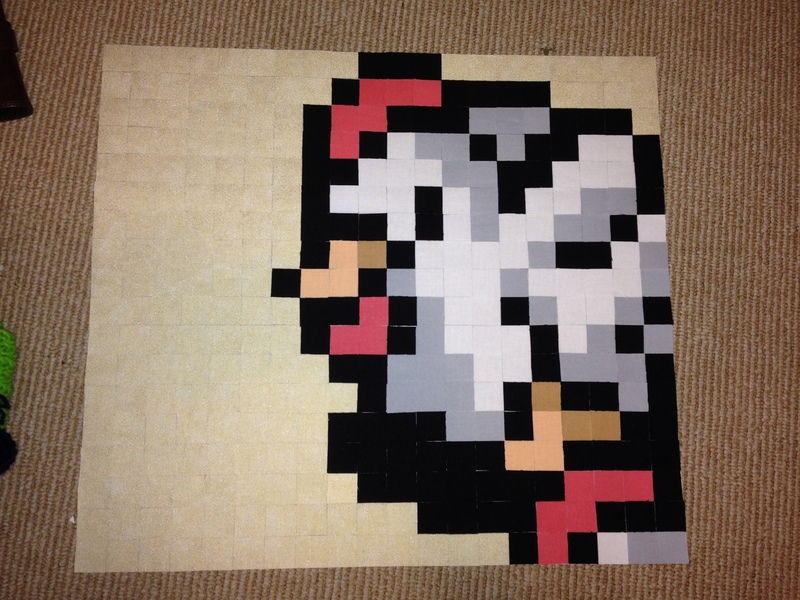 My goal is to have this block completely done by Saturday when the next block comes out. We’ll see!